Witches, sangomas, ancestral spirits – there’s magic in Mapungubwe. ‘Place of the jackals’ in Venda, Mapungubwe is a World Heritage Site and national park in northern Limpopo, home to the most sophisticated ancient kingdom in Southern Africa – mostly still underground, unexcavated. ‘A cultural landscape’ as the sign says at the park gate, nobly ensconced at the confluence of the Limpopo and Shashe rivers, where South Africa, Botswana and Zimbabwe meet. A sacred site to the many local peoples who claim ancestry here. At its heart is the Hill, a looming massif of red sandstone presiding over a valley rich in artefacts. Mapungubwe Hill is the ‘iceberg tip’ of an archaeological record holding 50 000 years of human history. At its base, field guide Kgomotso Makwena takes us back through time. He leads us down into an excavated pit, an outdoor mini-museum showing the layers of settlement on the Iron Age site, dating from 1220–1290 AD when Mapungubwe flourished as a capital city, the forerunner of great Zimbabwe. Bones and pottery shards protrude from the dirt. Kgomotso points out the blackened layers “where they may have burned the home of a witch”. 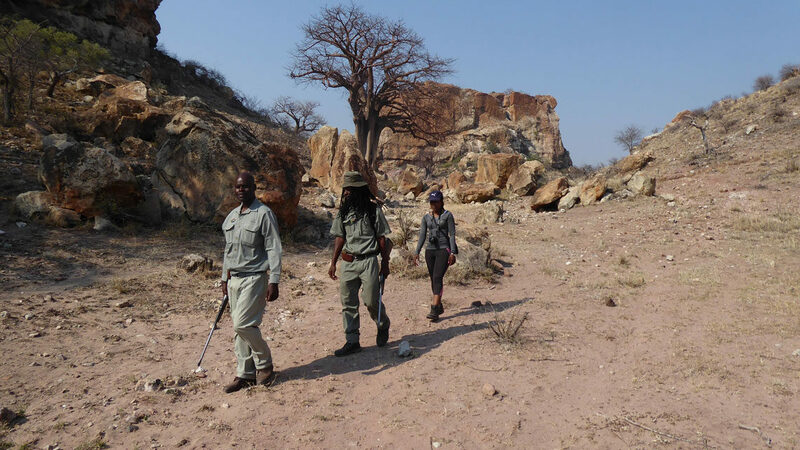 A SANParks guide leads guests on a guided walk with Mapungubwe Hill in the background. That boy, Kgomotso’s uncle, paid for his actions, locals believe: he went prematurely blind. But Van Graan and his son, Jerry, the story goes, ascended the Hill that night and on top came across the biggest gold find in sub-Saharan Africa, including the renowned golden rhino, gold bowl and sceptre believed to belong to Mapungubwe’s nameless king. An archaeology student at the University of Pretoria, Jerry reported the find to Professor Leo Fouche, inaugurating the university’s involvement in excavating Mapungubwe and housing the artefacts. Excavations since 1933 have yielded gold and clay objects, gold and glass beads, shells, and animal and human remains. The sun sets behind one of Mapungubwe’s iconic baobab trees. On top of the Hill, surveying the ochre cliffs of the Limpopo-Shashe basin, the glint of the rivers in the distance and the armies of baobabs standing sentry, you could imagine living here as the king or one of the royal family. Commoners were relegated to the foot of the hill. Trade, cattle and agriculture were the mainstays of the Mapungubweans and created a class society with spiritual leadership. Mapungubwe has no recorded history, though there are many oral histories of the place and still aspects of Mapungubwean society among Venda communities today. Across the bushveld valley among other cliffs lie the ruins of K2, an earlier settlement from 1000–1220 AD where people, pastoralists, lived before they moved to the hill “for greater security”, Kgomotso says. Further off to the northeast, along the Limpopo River, lie the remnants of an even earlier settlement, Zhizo or schroda, which thrived from 900–1000 aA. The settlement on the Hill represents the apex of life in this valley, the most complex social structure. All that’s left of its 5 000 people are remains, found in 27 different graves on the hill itself and in 93 other graves further afield. Hide looking out over the Limpopo River. Tree-top walk along the Limpopo River. We follow in his footsteps, surrounded by a riverine forest, with the chartreuse fever trees glowing about us, vervets and miscellaneous birds peeping through the branches. If you’re lucky you’ll see a Meyer’s parrot or Pel’s fishing owl. The river is relatively low, but its swathe is wide, still majestic. Later that day field guide and activities co-ordinator Leonard Luula and Kgomotso take us walking across the river sand, full of hippo and elephant tracks. We see a clutch of elephants lumbering across a lush plain full of lala palms. Also on the tour are Jan smuts’ holiday house, a ruined two-room bungalow on a cliff looking over the Limpopo; the confluence of the Shashe and Limpopo rivers; and Seruto Hill, used by rainmakers eons ago and the inspiration, it is said, for the design of the Voortrekker Monument. That night we sleep at Leokwe Camp, the park’s main camp, in a lovely earth-coloured rondavel at the edge of a mopane grove, surrounded by rosy cliffs topped by drip-castle rock formations. In the thick of the night we are wakened by telltale snapping, crunching and rumbling. At least three young elephants are feasting several metres away from us under the moon. 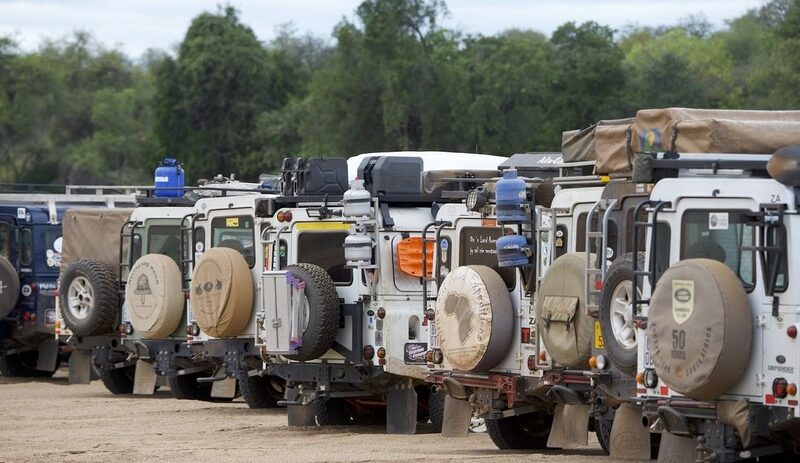 The next day we exit the main gate and drive west, re-entering the park and arriving within the hour at the tented camp, not far from the Limpopo again. Moving from east to west in Mapungubwe is moving from the light into the dark, from the sun into the shade. A troop of vervet monkeys welcome us, glad to see more purveyors of food. They scramble off our tent, more gumpoles and wood than canvas, peacefully tucked under a giant nyala berry tree. One rascal circles back and peers at us from under the deck as we unload the vehicle. We enter the tent with another load of supplies and soon see why: he has made off with most of a bag of ciabatta rolls. Outside in the trees all around monkeys are nibbling on them. We set off to explore ‘the West’ as we have heard there are lots of elephants there. Nothing prepares us for the thick forest of acacias and riverine trees – nyala berry, leadwood, giant figs, fever trees and countless others – in which dozens of elephants forage. Their numbers seem to multiply as you round another bend in the sand track, more and more large grey shapes in the tree shadows. An elephant ambles along a forest path, her calf following behind. In an acacia grove a matriarch, her near-newborn, and several adolescents browse. One is particularly nervous, jerking her head up and trumpeting once, half-heartedly. Then she relaxes, standing with one hind foot crossed over the other leg. The baby finds its way out of a bush, nudges its mother and seeks out her swollen teat, which she finally surrenders. When the baby is done, the matriarch faces us, less than 10 metres away. But rather than taking us on, she presents her calf to us, mother and child so close we can see their eyelashes, watching us watching them. We follow River Drive, a narrow sand track running parallel to the Limpopo with electric fence on one side and a forest full of elephants on the other. It’s not for the claustrophobic nor those with little nerve. It’s nearly impossible to reverse quickly on it. The bush is so dense you see only flashes of elephant, not whole ones, unless they cross the road. Up ahead on the left is a towering, sabre-tusked matriarch. We let her pass to join her herd on the right, in the bush. We think we’ve made it, but she turns as we sneak past her and trumpets an apocalyptic sound that sends us surging non-stop ahead, breathing faster. The next morning we awake to the cry of fish eagles and a cacophony of baboons, squirrels, woodpeckers, Cape turtle doves and other birds, plus a bushbuck peering in through the kitchen window. 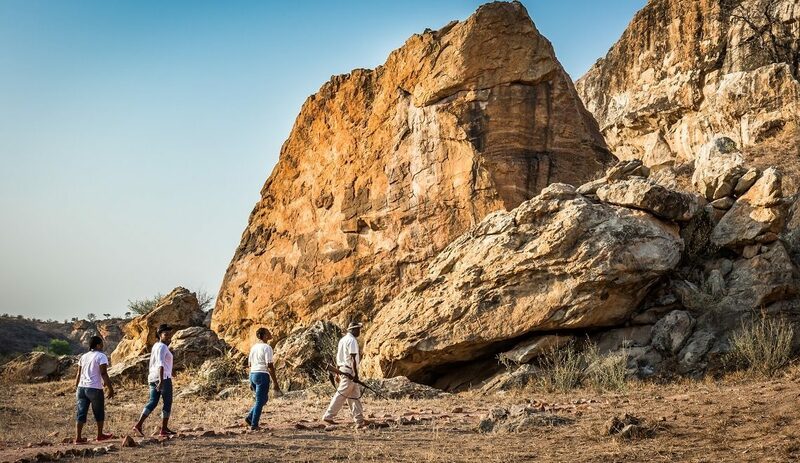 Dan Nkuna, caretaker at the Limpopo Forest Camp, and Leonard arrive to take us to one of the park’s roughly 150 rock art sites, which have yet to be opened to the public, though that’s on the agenda. We stop at a sandstone outcrop amidst open savanna and there, under a ledge are paintings of girls dancing the eland dance to mark their coming of age. The paintings, perhaps as old as 2 000 years, evoke the spirit of a vanished people. People, like the Mapungubweans, who disappeared or dispersed. People who moved on but left beauty behind them.